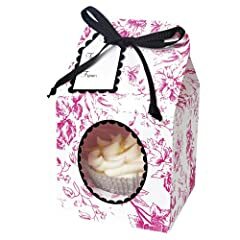 One way to avoid the mess of cutting and dispersing pieces of cake at a party is to provide cupcakes in these pink toile individual cupcake boxes. This kit comes with a set of four boxes and each has a clear, see-through window for display purposes that is trimmed in black edging with black ribbon. A very sweet friend who lives just down the street from me hosted a women’s tea one Saturday. Everything was dainty and feminine from the small, shaped finger sandwiches down to the pink stemmed water goblets. There were trays and trays of delicious appetizers so while everything was small, we certainly ate our fill. As each guest left, our host handed us a pretty box where we could see this marvelous, white frosting inside. I don’t know about the other guests but I went right home, devoured the contents and kept the box and re-purposed it to show off dried flowers and potpourri. The first time I put cupcakes in their own containers, it was an afterthought. We were going to a picnic with another family and at the last minute I thought it would be cute to hand them out that way so I ran to the local party goods store and picked some up. It was months later that I realized you could coordinate the wrapper with the colors of the individualized containers. These boxes have a matching, cardboard tray in the bottom in the same pink toile so you could use a darker pink cupcake wrapper, black, or something with a pattern in coordinating colors. The unique design of this individual cupcake box is going to motivate you to buy several kits so you can make them time and time again. The box comes as a flat card with step by step instructions for assembly. Basically folding and piecing. I like to keep a supply on hand so that if a birthday comes up at work or if I hear that one of our neighbors is celebrating some special achievement, I can bring a single cupcake over as a way of recognizing the event. Colorful and fun design will make a great cupcake box for any occasion. Popular color scheme for girls, teens, and women of all ages. The color combination is a classic and elegant design. If you’re going to use a lot of these for a wedding or a large gathering, get a few friends together to help you assemble them in advance. You can put these together yourself of course, but a project is always a good idea for most showers and you might even include making the cupcakes and decorating them (great video tutorial above for ‘baby shower cupcakes’). Use these boxes for keepsakes, party favors, party goodies, gifts, or party centerpieces to decorate your table. Kits, even prior to assembly, make great gifts for anyone who attends or hosts parties or would like to find ways to engage kids on weekends or rainy days. Not as simple to use as some of the pre-assembled individual cupcake boxes like the purse shaped ones but it is a great project, the results are stunning and can be used in a wide range of ways.